We all know the story of the hare racing against the tortoise, but we’d definitely have our money on the tortoise if it came with wheels attached like this tortoise, Tuly! The pet tortoise Tuly lost her front right leg when a rat bit it off during hibernation – imagine waking up to find your right hand missing! Luckily she was fixed up so she didn’t die, but she was heavily unbalanced causing her shell to wear away from rubbing against the ground as she moved. The solution? A toy tractor wheel. 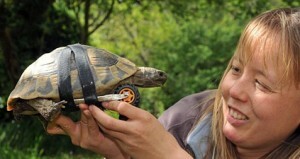 Perhaps even stranger than this story, is the fact that wheeled tortoises aren’t that uncommon. 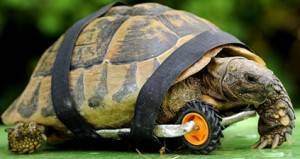 Search for ‘tortoise wheel’ in Google and you’ll see all sort of pictures of turtles with amazing wheels attached to help them keep moving.